Overview: This screen offers a sleek, all-white aluminum housing that is both durable and attractive. This EluneVision 120" Luna motorized projector screen’s high performance design introduces a rail mounting system that gives you the option of placing the mount wherever you like. Features: This 120” motorized projector screen features a 16:9 aspect ratio and an ultra wide 160-degree viewing angle, perfect for streaming movies. Bottom Bar: A weighted steel bar is located at the bottom of the screen. Despite the added cost, the weighted bar helps to keep the screen flat and wrinkle free for years. Installation: This model introduces square housing which allows the introduction of a rail mounting system – this gives you the freedom to place the mounting brackets where you want. The mounting brackets support ceiling mounting, chain mounting and wall mounting. Remote Control: It includes a remote control, wall panel and 110V power plug for plug and play operation. Operation: With the use of a combination of quiet and reliable synchronous motors and the self-adjusting bearings, the screen achieves an extremely low noise of less than 34dB. 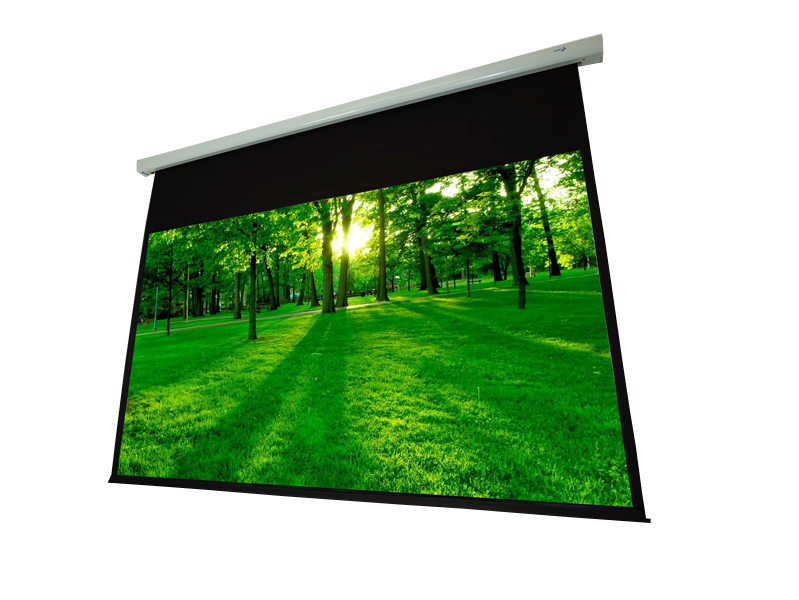 We recommend use of the screen with any 1080p projector to provide the best image quality.